Having 400+mg of Mg as a single dose causes a laxative effect in many people. Taking the dose two times per day virtually eliminates the laxative effect. Excessive food, water, Magnesium, etc. is too hard on the gut. Liquid form: Magnesium Chloride has good bioavailability and low laxative effect. "Magnesium is the fourth most abundant mineral in your body"
"The human genome project reveals that 3,751 human proteins have binding sites for magnesium." "...this one essential mineral activates over 350 biochemical processes in the body"
Appears to summarize and link to all of her information - from books, papers, YouTube videos, and podcasts. The cost to get an equivalent amount of magnesium ranged from just 2 cents to over $1.30! But quality and cost are not the only issues with magnesium: Some forms are better absorbed than others. They also believe that ReMag is just Magnesium Chloride. The use of herbicides and pesticides that kill off worms and bacteria in the soil. This is taken up by plants in preference to Calcium and Magnesium. Soil erosion as Magnesium is leached out by heavy rain. Acid rain (as occurs in air pollution) contains Nitric Acid. In the soil Nitric Acid reacts with Calcium and Magnesium to neutralise excess nitric acid. Eventually Calcium and Magnesium become depleted and the nitric acid reacts with Aluminium oxide in the soil. A reactive Aluminium builds up replacing Calcium and Magnesium in the plant. Calcium is needed for cell wall strength and Magnesium for chlorophyll for photosynthesis. So plants may grow taller and faster but are weak and lack chlorophyll. It is lost in grains during milling and making of white flour. It is also lost from vegetables when they are boiled. Fluoride in water and toothpastes binds to Magnesium making it unavailable to the body. Fluoride is insoluble and replaces Magnesium in bone and cartilage. Stress. Increased stress results in decreased stomach acid and decreased hydrochloric acid in the stomach results in decreased absorption of Magnesium. Commonly consumed antacids neutralise Hydrochloric acid, decreasing Magnesium absorption. IBS, leaky gut, gluten and casein sensitivities, funguses & parasites, vitamin D deficiency and the formation of Magnesium soaps in the stools as Magnesium binds to unabsorbed fats. Some foods can block the absorption of Magnesium. High protein diets can decrease Magnesium absorption. Tannins in tea bind and remove minerals including Magnesium. Oxalic acid in rhubarb, spinach and chard and phytic acid in cereals and soy also block absorption of Magnesium. Junk foods, particularly sugary foods all use up extra Magnesium. Saturated and trans fats alter cell wall integrity, making it more rigid which affects receptor site function and prevents nutrients from getting into or out of the cell. Drugs - some drugs eliminate Magnesium. Antacids, antibiotics and diuretics all cause Magnesium depletion. Large consumption of caffeine and alcohol cause depletion with their diuretic effect. Hypokalaemia (low potassium levels) can increase urinary Magnesium loss. Body size - the larger the body, the larger the Magnesium pool, then the lower the absorption from any source. Taking one substance will not make you well either nutrient or pharmaceutical. Having a complete balanced nutritional diet will go a long way to protect you against the many intrusions to health. Environmental factors that we deal with whether man made or natural occurrences can create serious disease issues regardless of how healthy you are and how well you maintain nutrition. In general if you consume a diet that is an abundance of vegetables, fruits, nuts, and enough protein and fats (please note grains in moderation) you will be among the healthiest. Not having enough of the nutrients that our bodies require will lead to disease states whether there are environmental factors or not. In my many years of researching the essential nutrients, I have found that the balance of the nutrients is the necessity for health. These items work together in ways that are so complex that we most likely will never be able to completely define all the interactions. However, there are some essentials that we do not get with our present diets in the US. These are vitamin C, vitamin D, iodine, and magnesium. You can add potassium to this list if you do not eat enough leafy green vegetables. Magnesium is extremely important in our biological reactions. There are more than 350 biological reactions that magnesium has been identified with. I believe that two of the most important are the control of cellular membrane potential and magnesium as the molecule of choice for our energy storage – ADP to ATP. About twenty five percent of the energy that is used for our bodies is the balance of calcium and magnesium and another twenty five percent is for potassium and sodium balance. This leads directly to how important the minerals are for maintaining a healthy weight. These important ions maintain the body electrochemical functions. If we are deficient in any of these then the ‘body electric’ starts to short circuit. I know an unusual term to describe what is going on with biological health but yet very accurate. The balance of these minerals is extremely important for the electrical function of the heart. The heart is made up of over sixty percent neural cells just like what is found in the brain. These cells function through a cascade of reversing potentials by a balance inside and outside various membranes of potassium, sodium, magnesium, and calcium. Magnesium deficiency is one of the leading causes of sudden heart failure in young healthy adults. Magnesium can be used up at a significant rate when you become vitamin D replete. It is extremely important to be sure to get enough magnesium when increasing your vitamin D levels. How much magnesium is ill defined but falls in a range of 2.5 to 4.5 mg per pound of body weight per day. The good thing about supplementing with magnesium is that you reach bowel tolerance before you reach a level that is too much for the body. Magnesium is an excellent laxative. Nuts and beans appear to be the richest in magnesium of anything that we consume. A quarter cup of almonds contains 99 mg of magnesium and 257 mg of potassium. In 1997, the National Academy of Sciences set a tolerable upper limit (UL) on intake of magnesium at 350 milligrams per day for individuals 9 years and older. This limit was restricted, however, to magnesium obtained from dietary supplements, and no upper limit was set on intake of magnesium from food sources. There are many factors that will vary our magnesium needs. The more stress you are under, the more magnesium you need. The more you use your brain in thinking, the more magnesium you use. The more active you are the more magnesium you use up. The larger frame you are, they more magnesium you require. We also believe that 70-90% of the population is deficient in magnesium and has a lot of catching up to do (could take more than a year). Once you have caught up you can go to a maintenance level. Dyspepsia (heartburn or “sour stomach”) as an antacid. Various magnesium compounds are used. Magnesium hydroxide seems to work the fastest. Preventing and treating magnesium deficiency, and certain conditions related to magnesium deficiency. Use as a laxative for constipation or preparation of the bowel for surgical or diagnostic procedures. A type of irregular heartbeat called torsades de pointes. Preventing type 2 diabetes in overweight, middle-aged women, when magnesium is obtained from foods. Chest pain (angina) due to artery disease. Hearing loss in people exposed to loud noise. Metabolic syndrome (a condition that increases risk for diabetes and heart disease). Chronic fatigue syndrome (CFS), when given by an injection (shot). Fibromyalgia pain, when used with malic acid. Nerve pain caused by cancer. A lung disease called chronic obstructive pulmonary disease (COPD). Helping to restart the heart. Improving energy and endurance during athletic activity. Cerebral palsy, when given in the vein of premature infants. Yes, it is important to have adequate magnesium intake and most Americans do not. A number of people have written about muscle cramps after they start sunbathing or taking Vitamin D. This is likely caused from the neuromuscular hyperexcitability of magnesium deficiency that is somehow unmasked by higher Vitamin D levels. Abbott LG, Rude RK. Clinical manifestations of magnesium deficiency. Miner Electrolyte Metab. 1993;19(4–5):314–22. 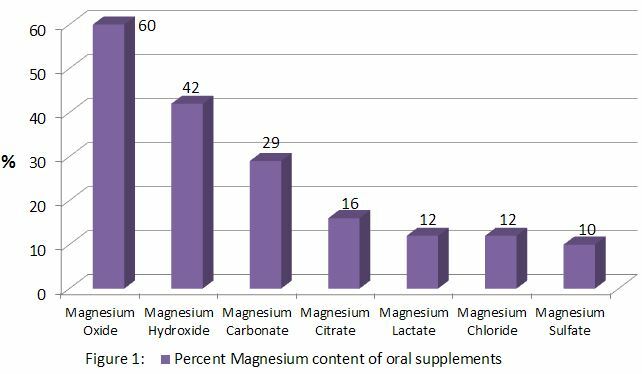 The latest survey of magnesium (Mg) intakes of Americans (NHANES) indicates the majority of Americans have Mg intakes below the Recommended Daily Allowance (RDA) in all age and race groups tested. In fact, the daily intakes were: 70 mg/day less than recommended in Caucasian men; 130 mg/day less in African American men; 60 mg/day less in Caucasian women; and 120 mg/day less than recommended in African American women. (The RDA is 320 mg/day for women and 420 mg/day for men.) Also, one statistic—called the standard error of the mean—was quite low. For example, +/- 6 for Caucasian men, raising the possibility that the vast majority of Americans are Mg deficient. Even more interesting were some of the top ten contributors for American Mg intake: coffee, 3.7% of intake; milk, 2.2%; beer, 1.8%; French fries, 1.1%. Not a word about Americans eating many seeds and nuts, the foods loaded with Mg. Dr. Earl Ford of the CDC, the lead author, concluded, "Because magnesium has many potential health benefits, increasing the dietary intake of magnesium in the U.S. population should be an important public health goal." Ford ES, Mokdad AH. Dietary magnesium intake in a national sample of US adults. J Nutr. 2003 Sep;133(9):2879–82. Apparently, Mg is better absorbed from foods than from supplements and Mg absorption varies with the degree of Mg deficiency. Mg is at the heart of the chlorophyll molecule, which is why green vegetables are a good Mg source. Other good sources are nuts, seeds, whole grains, dried fruit, and some fish. The richest source by far on a per gram basis is dried seeds, like pumpkin, sunflower, and sesame seeds, containing between 340–535 mg per 100 gram serving. High Mg foods were probably staples of Paleolithic man. Magnesium. Office of Dietary Supplements, NIH Clinical Center, National Institutes of Health. Magnesium (Mg) is the forgotten mineral, an "orphan," as Professor Robert Heaney of Creighton University says. It is the fourth most abundant mineral in the body, for it is involved in more than 300 biochemical reactions. All the enzymes that metabolize Vitamin D require Mg. It is also required in each of the steps concerned with replication, transcription, and translation of genetic information, and thus it is also needed for the genetic mechanism of action of Vitamin D. Zofková I, Kancheva RL. The relationship between magnesium and calciotropic hormones. Magnes Res. 1995 Mar;8(1):77–84. Carpenter TO. Disturbances of vitamin D metabolism and action during clinical and experimental magnesium deficiency. Magnes Res. 1988 Dec;1(3–4):131–9. Besides these two reviews, any scientist interested in Vitamin D and the immune system should read Interactions between magnesium and vitamin D: possible implications in the immune system. Two interesting cases of Mg dependent Vitamin D-resistant rickets appeared in the Lancet in 1974. Two children, one age two and the other age five, presented with classic rickets. 600,000 IU of Vitamin D daily for ten days did not result in any improvement in six weeks—in either x-rays or alkaline phosphatase—and the doctors diagnosed Vitamin D-resistant rickets. Almost by accident, serum Mg levels were then obtained, which were low in both children. After the treatment with Mg, the rickets rapidly resolved. Reddy V, Sivakumar B. Magnesium-dependent vitamin-D-resistant rickets. Lancet. 1974 May 18;1(7864):963–5. What does that mean? How can one treat rickets with Mg? Remember, these children took a total of 6 million units, that's a total of 6,000,000 IU of vitamin D over ten days (it was given as injections so we know the children actually took it). Thus, they had plenty of vitamin D but, in their cases, the vitamin D needed Mg to work. In 1976, Dr. Ramon Medalle and colleagues at the Washington University School of Medicine described five patients with Mg deficiency and low blood calcium whose calcium blood levels would not return to normal after Vitamin D treatment, a condition known as Vitamin D resistance. However, serum calcium promptly returned to normal in all five patients after treatment with Mg, raising the possibility that such Vitamin D resistance may be caused from simple, but severe, Mg deficiency. Medalle R, Waterhouse C, Hahn TJ. Vitamin D resistance in magnesium deficiency. Am J Clin Nutr. 1976 Aug;29(8):854–8. What is not known is how mild to moderate Mg deficiencies (like most Americans apparently have) affect Vitamin D metabolism. The safe thing to do is to eat green leafy vegetables and a handful of sunflower seeds every day (Trader Joe's sells a variety of seeds). If you can't, won't, or don't end up doing that, then take a Vitamin D supplement with added Mg.
a tiny amount of Vitamin A. Again, the wisest thing to do is to eat raw green leafy vegetables and a handful of seeds every day as that combination contains the co-factors Vitamin D needs. Please note that this will help supply the body with the nutrients that vitamin D needs, but is not satisfactory to prevent or treat the deficiency of these nutrients in which so many Americans are deficient. A recent pilot study was presented at this year’s annual meeting of the American Society of Clinical Oncology. The subject matter dealt with hot flashes that up 40% of breast cancer survivors experience. Specifically, researchers from Virginia Commonwealth University examined the applicability of magnesium supplements in this patient population. Over the course of 5 weeks, 29 breast cancer survivors who experienced at least 14 hot flashes per week were given 250 – 500 mg of magnesium oxide daily. The majority of the women (56%) found a >50% or greater reduction in their “hot flash score”. The overall conclusion was that 76% of the female participants reported a >25% decline in hot flash frequency and severity. The authors of this preliminary study stated that “Side effects and cost ($0.02/tablet) were minimal”. It’s also reassuring to know that a bigger, randomized, placebo-controlled trial is currently in the works that hopes to establish exactly how magnesium diminishes hot flashes. Dementia less likely with increased levels of Magnesium etc. Magnesium glycinate A chelated form of magnesium that tends to provide effective levels of absorption and bioavailability. Magnesium oxide A non-chelated form of magnesium bound to an organic acid or fatty acid. Contains up to 60% elemental magnesium and has stool-softening properties. Magnesium chloride/Magnesium lactate Contains only about 12% elemental magnesium but tends to have better absorption capabilities than magnesium oxide which has 5 times the magnesium. Magnesium sulfate/Magnesium hydroxide These are typically used as laxatives. Milk of Magnesia is an example of this type of magnesium. Since magnesium hydroxide can have up to 42% elemental magnesium, caution is required here not to take too much. Magnesium carbonate This form of magnesium has antacid properties and can contain from 29 to 45% elemental magnesium. Magnesium taurate This contains a combination of magnesium and taurine (an amino acid) that together may provide a calming effect on the body and mind. Magnesium citrate This is a form of magnesium with citric acid which has laxative properties. This can contain up to 16% elemental magnesium. Magnesium L-Threonate This newer, emerging type of magnesium supplement has shown great promise in absorption, as well as potential tissue and cell membrane penetration. Department of Veterans Affairs Medical Center, Northport, NY 11768, USA. Magnesium deficiency is seen with some frequency in the outpatient setting and requires oral repletion or maintenance therapy. The purpose of this study was to measure the bioavailability of four commercially-available preparations of magnesium, and to test the claim that organic salts are more easily absorbed. Bioavailability was measured as the increment of urinary magnesium excretion in normal volunteers given approximately 21 mEq/day of the test preparations. significantly higher and equivalent bioavailability of magnesium chloride, magnesium lactate and magnesium aspartate. but greater and equivalent bioavailability of magnesium chloride, lactate, and aspartate. Inorganic magnesium salts, depending on the preparation, may have bioavailability equivalent to organic magnesium salts. "Refining and cooking may diminish the Mg content very substantially (18). and the polishing of rice may remove > 80%. boiling vegetables may cause a Mg loss of > 50% (18). There are observations that the Mg intake of humans has declined very sharply during the past few decades (68). This may be due to the refining and preparing of food but also to the use of fertilizers with no Mg (53)." Published data on the bioavailability of various Mg preparations is too fragmented and scanty to inform proper choice of Mg preparation for clinical studies. In this study, the relative bioavailability of three preparations of Mg (amino‐acid chelate, citrate and oxide) were compared at a daily dose of 300 mg of elemental Mg in 46 healthy individuals. The study was a randomised, double‐blind, placebo‐controlled, parallel intervention, of 60 days duration. Urine, blood and saliva samples were taken at baseline, 24 h after the first Mg supplement was taken (acute‘ supplementation) and after 60 days of daily Mg consumption (chronic‘ supplementation). Results showed that supplementation of the organic forms of Mg (citrate and amino‐acid chelate) showed greater absorption (P ∓ 0.033) at 60 days than MgO, as assessed by the 24‐h urinary Mg excretion. Mg citrate led to the greatest mean serum Mg concentration compared with other treatments following both acute (P ∓ 0.026) and chronic (P ∓ 0.006) supplementation. Furthermore, although mean erythrocyte Mg concentration showed no differences among groups, chronic Mg citrate supplementation resulted in the greatest (P ∓ 0.027) mean salivary Mg concentration compared with all other treatments. Mg oxide supplementation resulted in no differences compared to placebo. We conclude that a daily supplementation with Mg citrate shows superior bioavailability after 60 days of treatment when compared with other treatments studied. Sums of averages of calcium, magnesium, and iron in cabbage, lettuce, tomatoes, and spinach. 2004 Journal of the American College of Nutrition released a study which compared nutrient content of crops at that time with 1950 levels. 2B) Advise everyone on earth to get better food. 2C) Add Calcium and Magnesium to tap water. WHO 2009: mentions water softeners and reverse osmosis systems remove all Magnesium and Calcium. Also that reverse osmosis systems add Sodium. Dead Soil Potash which has been used for fertilizer since the 1930’s is more easily taken up by plants than magnesium or calcium. There typically is Magnesium in soils which have been used/abused for a long time. It also is leached out by rain water, especially from acid rains. If a soil is determined to be too acid lime is tyically added, which again reduces the Magnesium. Fluoridated Water Banishes Magnesium Fluoride binds the magnesium, making it insoluble and it makes bones brittle. Stomach Acid is Essential for Magnesium Absorption A big problem for people such as the elderly who are deficient in stomach acid. Absorption of Dietary Magnesium Is Hindered A healthy body nicely sluffs off any excess magnesium. Our body was not evolved to store magnesium as it had always been readily available in foods. Problems with magnesium absorption include diseased intestines, low parathyroid hormone, amount of calcium, phosphorus, potassium (wonder about vitamin D), sodium, lactose, and iron. If take iron, take hours apart from when take magnesium. Heart Attacks 7 clinical studies has shown that 5-10 grams of intravenous magnesium reduced the risk of death by 55% after acute heart attack. PMS reduced with 400 mg of Magnesium. Recommend taking 50 mg of B6 to assist in magnesium absorption. Chocolate craving “is a sure sign” of magnesium deficiency. Chocolate has the most magnesium of any food. Diabetics both need more magnesium and loose more than most people. Magnesium Dosage 3-4.5 mg/lb of body weight (element) = 600-900 mg for a 200 lb person. Some researchers recommend 40% more for children and athletes. Magnesium Sulfate -> Elemental Mag = 10%, Bioavailability = ? Magnesium Chloride -> Elemental Mag = 12%, Bioavailability = ? Magnesium Hydroxide -> Elemental Mag = 42%, Bioavailability = ? Magnesium Malate -> Elemental Mag = 6.5%, Bioavailability = ? Magnesium Taurate -> Elemental Mag = 9%, Bioavailability = ? Magnesium is essential for the metabolism of vitamin D.
Magnesium influences the body's utilization of vitamin D by activating cellular enzyme activity. A 32-page guide to the benefits of magnesium, along with magnesium deficiency symptoms, written by Dr. Dean, is available as a free download at http://www.nutritionalmagnesium.org. Independent evidence shows that Vitamin D and Magnesium both reduce strokes. "For example, magnesium was first shown to be of value in the treatment of cardiac arrhythmias in 1935." atrial fibrillation, ventricular premature contractions, ventricular tachycardia, and severe ventricular arrhythmias"
"The arrhythmia burden of the patient with CKD is high, with the single greatest contributor to mortality in end stage renal disease (ESRD) being sudden cardiac death (SCD)"
"Food, drugs, and medications. Coffee, tea, chocolate, red wine, or simply overeating may cause rapid heartbeats that may be frightening when felt but are rarely serious"
"Both magnesium and potassium are intricately involved in the heart’s electrical stability (Cybulski J et al 2004); consequently, maintaining normal functional blood levels and ratios of each is important"
diabetes, 30% to 60% of alcoholics, fluoridation? Potash is more easily taken up by plants than mag or calcium. only 10 milligrams of Mg per teaspoon. "Roughly 70 to 80 percent of those older than 70 fail to meet their daily magnesium needs"
Magnesium plays important roles in the structure and the function of the human body. The adult human body contains about 25 grams (g) of magnesium. About 50 to 60% of all the magnesium in the body is found in the skeleton and the remainder is found in soft tissue, primarily in muscle. Magnesium is the second most abundant intracellular cation after potassium. Blood contains less than 1% of total body magnesium. Only the free, ionized form of magnesium (Mg2+) is physiologically active. Protein-bound and chelated magnesium serve to buffer the pool of free, ionized magnesium (1).